In this article, we will discuss the key ways that you can reduce the cost of your cartons or sleeves in 2019. We will take account of the fact that cost is not the only factor to consider, i.e. there is no point reducing the cost of your packaging if it does not look as good or function as well as slightly more expensive packaging. If you come across any printing terms you aren’t familiar with, you can refer to our Packaging Jargon Buster here. To fully understand how to get the very best value for your packaging, there are a number of key concepts to understand with regard to carton and sleeve manufacture and cost. Some tactics to reduce your packaging costs are straightforward while others require a delve into some technical aspects of printing. If you need different packaging for more than one product, try to order them all at the same time, even if the quantities for each are different to one another. This may help us reduce printing press makeready times and therefore may be a cheaper option. Always talk to us before you get a graphic designer to create the artwork – for 2 reasons – 1) the structure of the carton/sleeve must be agreed on first (we will supply your graphic designer with a carton Keyline which will ensure that they designed a card network to perfectly fit the carton structure 2) sometimes a minor change to the format of the artwork will mean your packaging can be printed more cost-effectively and look exactly as you planned. A slightly lighter board may reduce the cost of the board but your packaging is still fit for purpose. If you’ve always used the same board for your carton/sleeve, talk to us about different board types that may be cheaper but still fit for purpose. 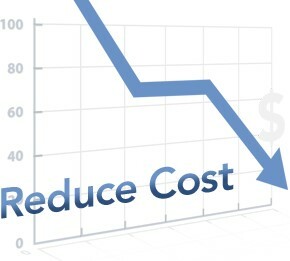 Your unit cost will decrease as you increase the quantity – talk to us about storage options if storage space for higher quantities is a problem for you. Talk to us about any special finishes your graphic designer has specified – we may know ways to get the same effect in a more cost-effective way. If you have been using the same carton design and structure for a long time, it may be time to re-examine this carton structure and see if a simpler structure could result in cost savings. If you re-use the same design with no changes when re-ordering your packaging, we’ll be able to re-use the printing plates and the cutting forme which means the cost will be less than the first printing. Now let’s take a look at two more technical ways to reduce your packaging costs. We have spoken above about the importance of talking to your packaging supplier about the structure of your carton before you get your graphic designer to begin designing the look of the carton. In order to get the best value, it is equally important to show the draft graphic design of your carton /sleeve to your packaging supplier before you sign off on the artwork. The reason for this is that, in some packaging designs, all the creative effects and colours you want can be created out of 4 colour process only or in other packaging designs, it is necessary to create the design out of 4 colour process and 1 or 2 extra colours ( making this carton a 5 or 6 colour printing job). These extra colours are sometimes also known as “special” colours or “brand” colours. This is because some company logos or designs use “special” inks that cannot be created out of the four colour process system. You can read more about the difference between special inks and four colour process here. A carton that requires the use of five or six colours on the printing press will be more expensive than a carton that uses only 4 colour process. Does my carton need the extra colours? How can you, as a packaging buyer, decide whether your carton design requires four colour process only or 4-colour process plus one or two extra colours? To decide this, you will need to show the draft carton design to us in the early draft stages. We can check to see if your graphic designer has specified four colour process only or four colour process plus 1 or 2 extra colours (a total of 6 colours). In some cases, it will be necessary to print your carton design using the full 6 colours (4 colour process plus 2 extra colours). In this case, the extra expense of the two colours is unavoidable. However, in some cases, the design effect that your designer is trying to achieve can also be achieved equally well out of four colour process. We will explain how to get your artwork set up or changed to achieve the best overall result, balancing costs with the number of colours used in your packaging design. Therefore, in this case, you can avoid the extra expense of the one or two extra colours. How do we decide whether or not the one or two extra colours are necessary? We decide whether the extra/special/brand inks are necessary by checking if we can achieve the desired colour on the design artwork 3 using four colour process only. With some colours and logos, it is not possible to create these out of four colour process and in that case, a special/ brand/ extra colour is absolutely necessary. This may often be the case where a company logo has a very specific colour which is instantly identifiable with that company. Ask your packaging supplier to look at your artwork in the early design stages and ask them to specifically look at the number of colour proposed in that design and the cost implications of that carton design. Get your packaging supplier and your graphic designer together in the same room if necessary to discuss what is going to be the best result overall for your carton or sleeve. At Dollard Packaging, we are always happy to discuss your carton design and structure with you and your graphic designer to get the best overall result. Now let’s look at comparing packaging quotes from different suppliers and the importance of understanding what elements of the packaging quote are “one-off” costs and which elements are recurring costs. In order to manufacture carton or sleeve packaging for a new product or product range for our customers, we first have to make the specific tools for the job: keylines, printing plates, cutting formes, etc. As you would expect, each of these items has a cost. However, when a customer needs another batch of the same packaging in the future, (with no changes to the design or box/sleeve structure), these items are already in place. Therefore, we won’t have to charge you, the customer, for these tools again as we keep them on file for you. If the design and the structure of your carton/sleeve remain the same, then on future reprints you will only have to pay for the board and the printing and finishing process. therefore it will be cheaper than the first time you got the carton/sleeve printed. When you compare packaging quotations from different suppliers, it is important that you can clearly see which parts of the quotation are for those one-off items such as keylines, die-formes and printing plates and which part is for the recurring costs which will apply every time you get the carton or sleeve reprinted. You can read a more in-depth article on this topic here. It is always good practice to involve your carton or sleeve supplier at the very early design stages and ask them to advise you of the best overall option. At Dollard Packaging, we are very happy to discuss any aspect of your packaging and try to help you get the very best value.